A lot of things were riding against the Devils for the 07-08 season. players prior to the start of the season. Among other things. hour, a page out of Herb Brooks' book there. sugarcoat anything when talking about his team to the press. better results, even: the first ever 50-win season in franchise history. 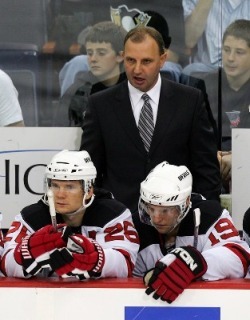 result... then took the open Calgary Flames coaching job two weeks later. Whatever. It is what it is. You can call him a douchebag and every other name in the book if you want. I'm choosing not to get pissy about it. Life's too short for it. He went back to coaching the Red Deer Rebels in 2012.